Fairly light on spoilers, but see the movie first. This is a review I’ve been meaning to write ever since Greg’s scathing take. He’s completely wrong about the film, but wrong in a Greg way, which is to say, entirely consistent with how he views films, so s’all good—I expect nothing less from him, and love him for it. But, the thought of his take being the only take on the film on this site just isn’t right, because it’s a great goddamn film. 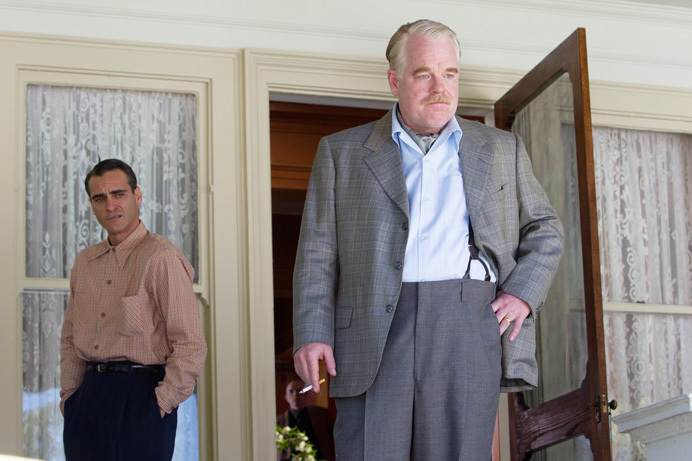 And in the wake of Philip Seymour Hoffman’s passing, it’s certainly been on my mind, given its central theme of addiction—a theme that has, for some reason, eluded many critics. The infatuation between Freddie Quell (Phoenix) and Lancaster Dodd (Hoffman) is never outright, hammer-over-the-head explained in The Master, leaving many viewers—and even professional reviewers—to come to the most obvious and tittilating and childish of conclusions: that they are deeply closeted homosexuals in love. Undeniably, there’s a degree of homoeroticism to many of their interactions, but to chalk their bond off as mere ‘gayness’ is to ignore what these two men are truly struggling with, and what brought them together in the first place—alcohol.